Hollywood has been turning books into movies since its inception, and the 1930s and 1940s were no exception. During these two decades, film makers took several of the crime novels written by such greats as Dashiell Hammett and Raymond Chandler, and produced highly successful pictures. Murder, My Sweet was a 1944 adaptation of Chandler's Farewell, My Lovely. The reason for the title change? Studio executives were concerned the public would think the movie was a musical. Chandler, who was born in Chicago, but raised in England after the divorce of his parents, did not publish his first novel until he was 50 years old. His "day job" was as an accountant, and he eventually rose to the position of Vice President at Dabney Oil. He lost his job during the Depression and decided to go into writing full time. There was a large market for short stories and serial pieces, and Chandler found his niche in the "hard-boiled" detective style popularized by Hammett and Earle Stanley Gardner. 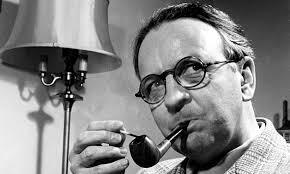 Moving to California, he worked on several screenplays including Double Indemnity and Strangers on a Train. By the mid 1940s his books were selling so well, he could pick and choose his projects. Considered to be one of Chandler's masterpieces by most critics and movie goers, Farewell, My Lovely continues to be in print. It was remade into a movie under the original book title in 1975 with Robert Mitchum as Philip Marlowe, There were also several radio adaptations. For those of you unfamiliar with the plot, the story begins with Detective Marlowe involved in a missing persons case. While at a bar, he happens to see an ex-con looking for his girlfriends who was supposed to have waited for him during his jail term. Frustrated at the lack of answers he gets about the woman's whereabouts, the felon kills the nightclub owner. Because the victim is a black man, there is little interest from the police in finding his murderer. Marlowe decides to hunt down the girlfriend in an effort to find the killer. Typical of Chandler novels, there are twists and turns, police corruption, secret identities, and blackmail. Set in the fictional location of Bay City, most scholars agree that it is a stand-in for Santa Monica, well-known for its government corruption during the Depression. The story itself is a compilation of ideas and plot lines from three of Chandler's short stories. 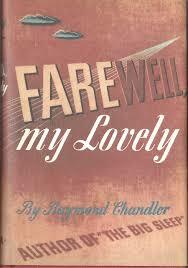 A classic noir book, Farewell, My Lovely is a highly entertaining read. Check your public library. You'll probably find it on the shelves.